About two weeks ago this picture popped up in my Google Reader from Re-Nest. It’s part of their Living with Less series, where each week they’re tackling a different aspect of cutting down clutter and simplifying life. 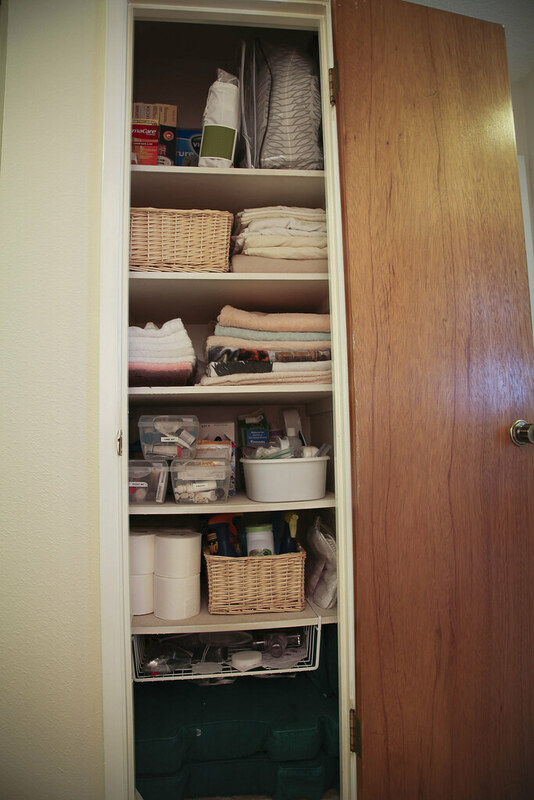 It inspired me to do some organizing of my linen closet, especially I’d had been meaning to do that for quite some time. The bottom shelf contains the original cushions that go to these two Chinese chairs I inherited from my late grandma. The hanging basket on the shelf edge holds all the additional accessories that go to my Shark 2-in-1 Vacuum and Steam (I use it to clean the kitchen and bathroom floors). The next shelf up holds extra toilet paper (nice because this closet is directly across from the guest bathroom) and one of the baskets holding my carpet/room cleaning stuff: Febreze, Cartpet Deodorizer, Flea spray, Woolite carpet cleaner, and pet hair remover (this thing is amazing, will blog about soon!). The shelf above that houses my sewing kit, itchy kit, owie kit, cold kit, nail care, and basket with my Epsom salts, and ear cleaner. When I first moved out on my own, I did a lot of shopping at the Dollar Tree, and that is where I got all the containers for my kits. Cheap and functional! The shelf above that has all my hand towels and extra bathroom/beach towels. Above that the big basket has all my washcloths and my consolidated bedsheet/pillow case collection. The top shelf has heating pads, box to the humidifier (which is living in my bedroom), and my old duvet cover. I snagged the PILATORP baskets from IKEA, which helped organize some of the stuff within. Everything else I already had it was just a matter of rearranging things. In fact the only thing I need to get is a jar to put my Epsom salts in; I discovered I have two open cartons and would like to consolidate them into one. The perks about tackling this? I was able to get rid of some stuff and organize everything I wanted to keep. I even ended up freeing some closet space in my guest room by going through my bedsheets and moving them to the hall closet.